hen I asked for suggestions as to what you'd like to see more of one of the requests was more organizing tips. At first I was a little reluctant to share what I do, because it's sort of a hodge-podge. However, with the economy being what it is, I'm hoping more of you are looking for solutions like mine. I don't go out and buy drawer dividers and organizers. I use what I have on hand. I do have a place for everything, everything isn't always in it's place, but it is most of the time. While you are getting organized it doesn't make sense to go out and buy a bunch of organizing containers until you know what you have and everything has a home. Go the cheap route for a while using what's around your home until you have an idea of exactly what you have and what you need. In some cases, there is a lot to be said about having the right tool for the job, don't try replacing file folders with cardboard boxes. However, until you know how big a file drawer/box/cabinet you need, it is perfectly acceptable to store file folders in a cardboard box. Once you have all your files determined, then go looking for a file box/drawer/cabinet. Need help figuring out what to keep? Check out Managing Paperwork. Before buying a compartmentalized container for catching clutter in your hot spots, put a basket, bowl, plate, tray or anything else you have on hand there first to start catching clutter. You want a good idea of what you are "catching" first. It doesn't make sense to get a small bowl for keys and change if most of what ends up in your container is mail and paperwork. I hope those examples have convinced you to shop around your house for storage first, at least until you have a good idea of what you need to store. Don't forget to ask yourself do I really need it? Why buy something to store something you don't need. Plus you might find you really like your homegrown storage choices. 7) Use an ice cube tray in a junk or desk drawer to hold paper clips, screws, batteries, safety pins, coins, matches, etc. 9) Use the bottom of cereal boxes, cracker boxes, pudding boxes, pasta boxes, as shallow drawer dividers just measure the depth of your drawer and cut the bottom of the box an 1/8" shorter. If you don't like the look of the cardboard, you can line the insides of the boxes with drawer liner or scrapbook paper. 10) Cover shoeboxes with pretty paper and use them as photo boxes or to corral items in open viewable areas, like office shelving. What are your ideas? Leave additional suggestions in the comments. Also, if you have a particular problem area you'd like me to cover on Wednesday, let me know. Hi Barbara! I totally use teacups and creamers for my jewelry and makeup!! It makes for dainty decoration too! It's like you read my mind...I've having SO much trouble organizing my house, and while I have to admit I love organization products (the container store is one of my favorite stores hands down) I feel like I have tons of baskets/bins around the house that I need to utilize first. Blaze: I entirely imagine you as a teacup and creamer girl! Based on your bedroom pics and your fairy tea party post and all the lovely photos you've shared. Melissa: I hope this week ends up being quite useful then. For both of us, as it's incentive to tackle an unorganized spot for me as well. What a wonderful post. 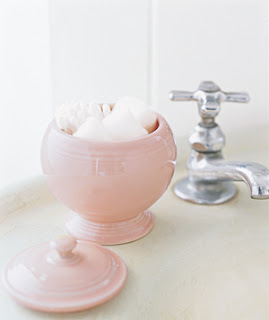 I never ever thought to use creamers and teacups, love it! Of course, with a toddler around that may have to wait a bit but as soon as I can, I am SO all over that idea! I really need to carve out some time to work on decluttering. I used one of your earlier tips to try and do one room at a time, but with no help (men!!) it just gets re-cluttered. I like the idea of bins and baskets and catch-alls. Maybe that will help him. Kiy: I'll do what I can for kids, I can share the set-up I have in the nursery, kid's playroom. The biggest thing is to have her help put things in the right baskets when your done. Make a game of it. Get her used to it now, it's harder if you wait until she's older. Tamy: I have a bunch of plain white plastic trays I use in the kitchen, they used to be my silverware trays in the old house (normal trays were too wide, so I improvised) now I use them throughout the kitchen. I love them because I can just throw them in the dishwasher every once in a while! Thanks so much for stopping by Rose Cottage to say "hi!" --your visit was such an encouragement! I really have enjoyed your tips. I think I need to do a house walkthrough and look in the cupboards to think how I might use some things differently! Lovely ideas to use what you have for decorating! I repurposed a washed-out artichoke-heart jar for my makeup brushes, and I have cute plastic cups that coordinate with my bath decor to hold q-tips and cotton pads. A large glass jar holds cotton BALLS since they don't get used as much, so that has a lid. I make origami boxes out of scrapbook paper to catch little things. Unfortunately I have a lot of "catching" to do - I have got to do a massive spring cleaning. Uck. DebbyKay: Thank you for the sweet comment! I really enjoy your blog, just added it to my feed reader this week. Becca: I love the origami boxes idea!! !